Shares of Hormel Foods Corporation (NYSE:HRL) gained 10.8% across October, according to data provided by S&P Global Market Intelligence. The stock substantially outperformed the market in the month, though it was also bouncing back from some September sell-offs. Hormel posted its October gains despite seemingly little news. Shares may have bucked broader market trends because of expansion plans that the company announced in late September. It's also possible that some investors moved into the stock because the company deals in consumer staples (a historically nonvolatile sector because sales tend to be resilient) or because the company has a great dividend-growth track record, having increased its payout annually for 51 years running. Hormel stock hit what was then a 52-week high on Sept. 13 but closed out the month roughly 6.5% lower than that high mark. Shares regained some ground at the end of September following news that the company was expanding its Burke Corporation production facility in Nevada, Iowa -- a move that indicates Hormel sees increasing demand for its products. The $150 million expansion investment will add 210,000 square feet to the existing 225,000-square-foot production facility and bring on 225 new employees to aid in the production of cooked meats that are used by pizza operators and food manufacturers and distributors. 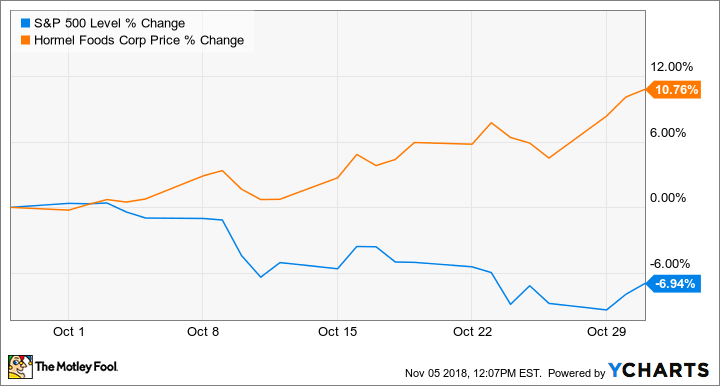 Some of the gains in October appear to have been, at least partially, a response to sell-offs that came on no substantial news in September, and the stock went on to close the month out at a new 52-week high. Hormel has a strong portfolio of category-leading food products and has been devoting more resources to growing in higher-margin categories, so it looks to be a dependable business with steady earnings growth potential. The company also has a fantastic track record of dividend growth, which could look even more appealing as investors weigh the possibility of a more pronounced correction for the broader market. Shares trade at roughly 24 times this year's expected earnings and come with a 1.7% dividend yield. Hormel is scheduled to report fourth-quarter earnings and host a conference call before market open on Nov. 20.